Christiane Engel - Scrapbook: 4th of July GiveAway! Enter my US states print giveaway by leaving a comment on this post about your state and one special fact about it ( can be anything - even a myth ). 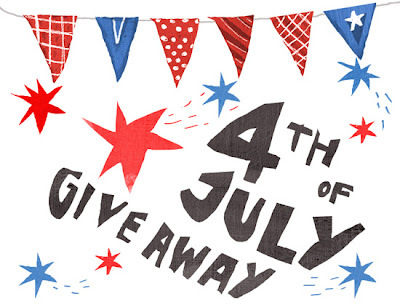 I will draw one lucky random winner from the commentators just after 4th July. 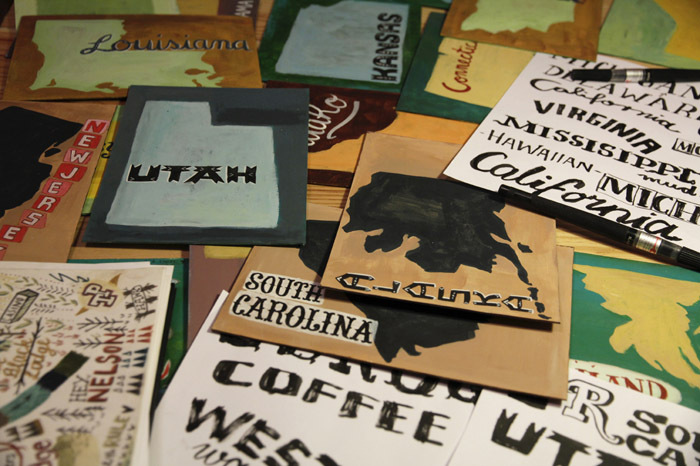 The prize is one print of any US state from my painted postcard project, you choose! So, let me know whatever you find interesting about your state! THE WINNER: ........Kelly J. R........!!! I live in New York but am originally from Illinois. One of the things I appreciate about Illinois is the transition between rural and urban life. Driving between Chicago and my hometown you can, literally, go from the grit and frenetic pace of Chicago to the serene, endless cornfield landscapes of farm country in a matter of minutes. It's a great thing. Vermont's state fossil is of a whale! It's true. Once upon a time Lake Champlain was once a sea, the Champlain Sea. We also love our Friday night fish fries, beer and cheese! I'm a Nebraska gal. My college town here in NE was where Kool-aid was created! I grew up in Washington state and was told that our state bird is the geoduck (or gooey duck) by my uncles. What they failed to mention was that the geoduck is actually a strange looking clam. It is a long running family joke. I hail from the "Garden State" where I think our state bird is the golden finch (if memory serves me correctly), and our state mythological creature is the Jersey Devil. I LOVE your postcards, I found it through another blog just now.... I am from California, Chula Vista Ca that is right next to Tijuana Mexico. Chula vista is one of the fastest growing cities in the state of California, funny because Chula vista back in the 30's-50's was nothing more than fields of lemon trees. I live in California, but I'm from the beautiful state of Oregon. Fun fact... Oregon was declared a state on Valentine's Day! Hence my undying love for my home! I live in Wisconsin and one random fact about my home state is that Somerset is known as the "Inner Tubing Capital" of the world. In the summer you can go camping there, rent innertubes, and float on down the river with your friends and a cooler full of beer. It's a great time! Okay, apparently a lot of Wisconsinites read your blog! I, too, hail from Wisco. I grew up in Marathon City, which is known as the Ginseng Capital of the World. My summer job, from 12-17 years, was weeding, seeding and picking rocks in the ginseng gardens! Tough work, but it paid well and I had a blast with my friends. Great giveaway! I live in Minnesota the home of Paul Bunyan, Paul Bunyan is not so much exclusive to Minnesota, but the stories about him told in Minnesota talk about this larger than life lumberjack who lived in the “North Woods” and don't forget his sidekick, Babe the Blue Ox. OMG! a giveaway! of my favorite artist! How great!! I'm from Bozeman, Montana but now i live in Moscow, Russia (which is cool of course but i miss my lovely Big Sky State incredibly!) Not far from Bozeman there is Butte town which was Montana’s largest city until 1960, and was one of the largest cities west of the Mississippi for generations. Butte experienced every stage of development of a mining town, from camp to boomtown to mature city to center for historic preservation and environmental cleanup. It was one of the largest and most notorious copper boomtowns in the American West! I'm from North Carolina, where we love blackberries, whiskey, and NASCAR racing. True story: nothing could be finer than to be in Carolina in the moooooo-ooorning. I'm from MICHIGAN! Cherry capital of the world!!! I'm from Arkansas! Our state beverage is milk and we have the watermelon capital of the world - Hope, AR! i'm a wisco girl all the way! did you know we have the second highest concentration of organic farmers in the nation? :) makes my heart glow. Born in Madison and now living in Ed Gein country. We have the dubious honor of having the inspiration for countless horror movies do his deeds less than 6 miles from my house. Wow, thanks for contributing, everyone!! These are all fantastic facts!! I am from wauwatosa, wi, a great city outside of milwaukee....there is a legendary home on Lake Drive better known as the "witch's house". The home had all sorts of crazy statues on the front lawn and the legend was that the woman who lived there faced them all to the lake in hopes of returning her husband and son who had drown in Lake Michigan. As kids we used to drive by at night and it would scare the heck out of us. Hi Christiane! I'm from Idaho! ~It is against the law for anyone over the age of 88 to ride a motorcycle. ~In Boise, Residents may not fish from a giraffe's back. ~In Idaho, riding a merry-go-round on Sundays is considered a crime. ~The Anti-delinquency statutes in the state prohibit juveniles from deliberately stepping on ants. ~In Idaho law forbids a citizen to give another citizen a box of candy that weighs more than 50 pounds. Thanks for the cool post and so much info! My fabulous roomie's from NeyooGeoirsie. Her Pa's in the Secret Service - we even have the mugs in the cupboard to prove it! I'm from the Cleveland area of Ohio and Cleveland was originally supposed to be spelled "Cleaveland" after Moses Cleaveland, but it was spelled wrong on the official maps of the region and that's why it's spelled Cleveland. I am not from the US but from Mexico. Big fan of your illustrations. Christiane, cool pictures! Also i loved the others from the ghost towns in MT! I've been to Nevada and Virginia City, too and it's great to see someone else's photos from there! Thank you for sharing!